Colliers International Australia general manager of corporate marketing and communications, Emma Reiners, told CMO the company previously managed a one-size-fits-all website that wasn’t optimised or easy to use for end users searching properties globally. While initial conversations with its US head office had stressed the need for a consistent digital user experience globally, the lead time for a US-led technology advancement proved too long, Reiners said. Instead, the A/NZ business directly recruited New Zealand-based consultancy, OneClick, to assist its in-house teams launch a new site, after OneClick’s successful role building websites for Collier’s Canadian and US businesses. The websites are built off the back of Sitecore’s Experience Platform technology. The first phase of the relaunch took five months and gives online users the ability to search more than 6000 active listed commercial properties managed by Colliers across A/NZ, along with related content and research data. Other key features include an enhanced search capability with ‘predictive search’ plus a ‘drag map’, where site visitors can click on a listing and view its location instantly. “We really wanted to produce a site that was core from a strategic perspective and that would allow us to make our people and profiles more discoverable, make it easier for people to search our properties, and bring personalisation into the platform,” Reiners said. Helping drive these capabilities is Collier’s CRM system, introduced a couple of years ago, which feeds property data directly through to the website in real-time. Previously, website data came from third-party sources. 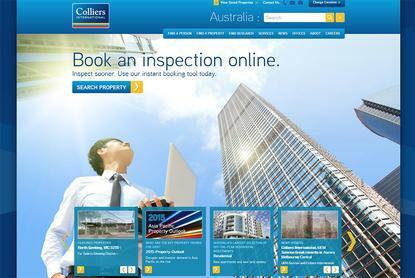 In a statement, Colliers general manager of corporate marketing, Belinda Scott, said implementing a consistent platform across the group’s operations and deploying a more sophisticated content management system gave clients a more intuitive experience and better accessibility to property information across both mobile and desktop platforms. The next phase of work will see a ‘My Colliers’ feature introduced later this year in New Zealand, followed by Australia. This will allow end users to better control their browsing experience, firstly by connecting to the site through their LinkedIn account, and then managing subscriptions, preferences and stored information online. Relevant information from the site can then be collated and sent to customers via email. Reiners also said finalising the build of the residential component of its website is a priority for Q2. The long-term goal for Colliers International is to have a seamless experience for all users worldwide, she said. “It’s particularly important when you consider the nature of our business,” Reiners said. “Clients are not segmented by geography and what they want is not vastly different to what clients want in the US and Europe. It’s applicable to all corporates, mum and dad, small business owners. Better utilising content is another big area of focus for Colliers this year. In the past, the team would produce a publication or research piece for a specific program then just move on to the next thing, Reiners said. “What we want to do is make content more accessible to users and via multiple channels,” she said. A survey of customers undertaken last year identified the types of information users wanted to receive. This is now informing what content is promoted online, how often to push out information services, and in the right formats, Reiners said. To further assist its digital push, Colliers brought on a digital marketing specialist late last year and also maintains content marketing specialists. Having more sophisticated metrics from the new website platform also gives the Colliers team the ability to tweak content on the website dynamically depending on where users are looking or popular content, she said. In addition, the group is able drill down on where end users are coming from, and what are they looking at in terms of property attributes, she said.